Along with an opportunity to explore their political alignment, libertarians offered attendees of the festival “Alive FREE Happy” bottles of cold water to combat the afternoon summer sun. “It was really hot,” said Kelly Barnes, “and the Free Water sign brought a lot of people over. We got to administer a lot of quizzes and invite a lot of people out.” It did the trick if you asked the young people in attendance that day. 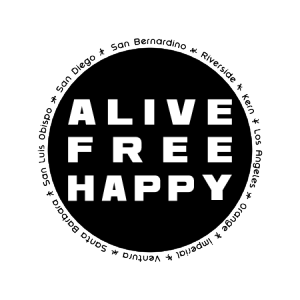 They flocked to the booth asking for “ALIVE FREE HAPPY” buttons that were meant, at first, to be awarded to those scoring in the north quadrant of the chart, but became an object of desire for young people looking for outlets in one of the worst economically hit counties in the nation. “The buttons were a hit!” a gregarious Boomer Shannon said. “I really appreciate the San Bernardino Generation Now guys for putting this together. When the city stopped sponsoring these festivals for budget reasons, it left a hole that these guys filled. I think it is a brilliant demonstration how government does not define community in a healthy society. Chuckling he added, “I am sorry that it took a recession like this to get them out of the way.” The festival is indeed the product of a group of civic minded young entrepren eurs who are seeking specifically to bring the city together to foster their own culture and to revive the town’s social spirit far away from the business of governing. Rusty Palmer an associate of the organizers invited the Libertarians out to the event after attending one of their meetings and finding himself hooked on the group. An entrepreneur himself, Rusty admits to a sleepless life of eating ramen, herding a group of young smart programmers in a start up aimed at empowering the youth workforce, and earning a masters degree at Cal State San Bernardino. 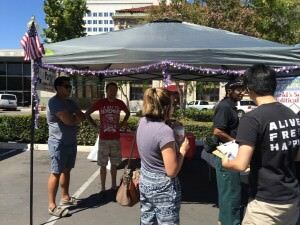 The only other political group that was represented at the event was the local Democratic Brownie Mary Club, a marijuana law reform caucus. 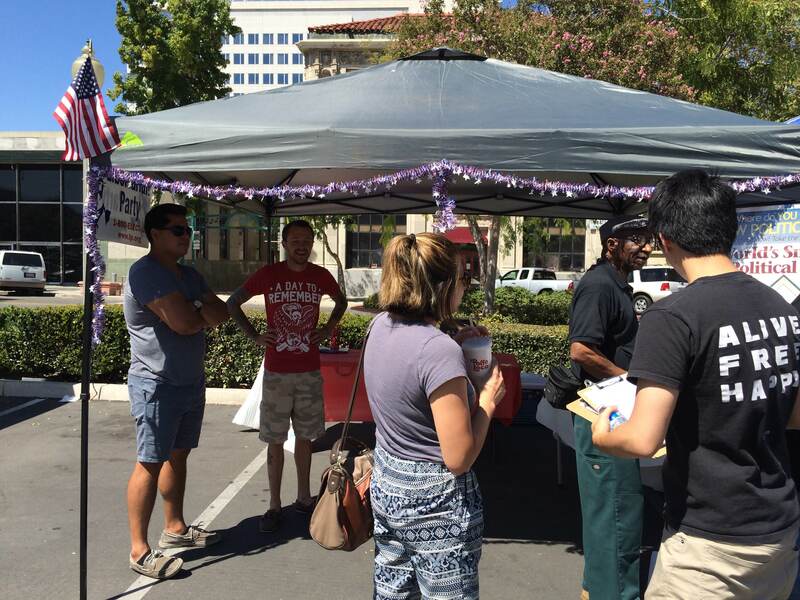 They were manned by people who were friends of many of the Libertarian booth workers. The SBCLP and its membership has a strong reputation from years working in the Inland Empire on legalization efforts including having taken active leadership roles in both Proposition 19 in 2010 and the ballot initiative Regulate Marijuana Like Wine in 2012. Glad to see the Libertarian Party is making waves in the election process!